I started watching the show Haven on Syfy when it began at the beginning of Summer mainly because according to the commercials it had some supernatural stuff happening. Anything supernatural is right up my alley. The show is based on the Stephen King novel “The Colorado Kid” which made it even more exciting because anything that Stephen King writes is a success right? I should have read the novel before the show came on the air just to get a feeling for what I can expect in the show but it never really occurred to me to do that. I finally did buy it this weekend and just finished reading it and I am even more confused about everything than I was before I read it. In the book, Vince and Dave, who are the 2 brothers who work at the newspaper, are telling the story of the Colorado Kid to Stephanie, a 20-year-old intern, how he was found, how they found out who he was and everything else about his death from 1980. According to the book, these “old” men are well into their 90′s and this was in 2005. Well, in Haven they are much younger, at least in their 70′s right? And the story of the Colorado Kid happened 25 years ago which would be 1985 not 1980. I know the show Haven is only based on a book and that it’s “only a story” but when you are interested in a story, you have to know what’s going on to understand it. Even if it’s all make believe. I was hoping this book would help me to understand Haven but it ended up confusing me more than I already was. I thought that the book was going to have all these strange occurrences that the show has but instead it’s just 2 men telling a story to a woman. 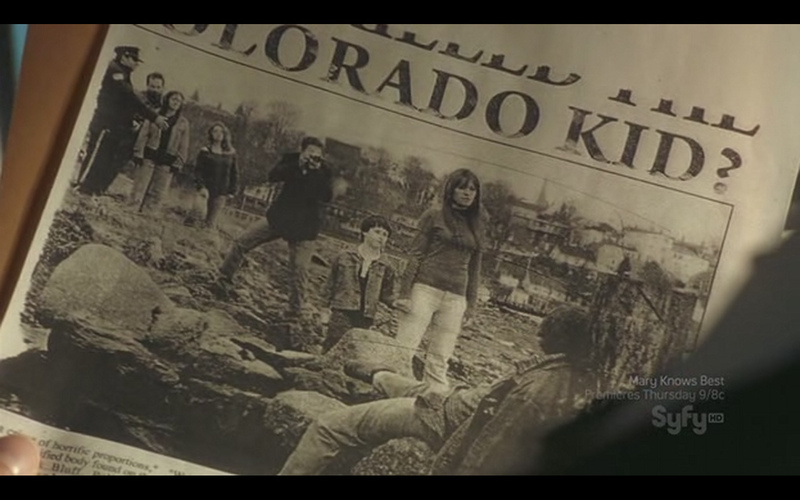 In Haven, there is a newspaper clipping of Lucy who is Audrey Parkers mother*. I don’t understand what that clipping has to do with the Colorado Kid considering they are looking up in the sky and the Colorado Kid was found dead by a trashcan. I tried looking for the newspaper clipping on the Haven page of the SyFy website but it’s not there. I tried doing a Google search but found nothing. I was hoping that I could get a closer look at the clipping to see what I needed to see to get the story but there’s nothing. I start to think of the Colorado kids wife and child but the wife was contacted a year after his death and flew to Maine from Colorado. The child however would have only been 2 years old considering he was 6 months old when his father went missing. This child is a bit older than 2 but the wife’s name wasn’t Lucy anyway (in the book). Oh, and what also confused me is that I thought this book was written in the 70′s or 80′s because the picture on the front cover of the book looks like an old picture. It’s supposed to be Stephanie, the 20-year-old intern right? Well, again, it looks like an older picture. Look at her hair and dress. Not something you’d expect to see an intern reporter to wear to work. At any rate, I found the book to give me no answers but I still enjoyed reading it. I think that if a person wants to know more about Haven they are not going to find any answers in this book. The show is just an extension to the book, the book isn’t going to answer the questions about what’s going on in Haven. * Update 2011-10-01: When I wrote this in 2010 I thought Lucy was Audrey Parkers mother but at the end of the 2nd season we all find out that Lucy and Audrey Parker are the same person. Mind blowing.